Roman Miscellany: Venetian Relics II: Dragon Bones? There can't be many churches that claim the actual bones of a fabulous beast; I wonder if any scientific tests have been conducted on them! Sadly most visitors ignore them and concentrate on the mosaics on the floor and apse. Afterwards, we had a fantastic meal at the nearby Ai Frari (above), where I fell in love with tagliolini (long pasta) with stewed cuttlefish, cooked in cuttlefish ink. Sounds ghastly but it was delicious! Honestly Father Nicholas... What tests are needed! Do YOU see any dragons flying about where you are? I don't where I am... I think that proves it - he, along with Saint Barbara who made them explode - got rid of all dragons. Case closed. What - you don't believe in dragons? Thanks for your kind words. I think you took my post rather too seriously - it was supposed to be tongue in cheek. It would be quite interesting, though, to know where those large bones came from, enabling the twelfth century Venetians to create the 'shrine' to the dragon -dinosaur? whale? some other large mammal? I do believe in dragons! I could even see one: fighting with my dad's patron, St. George, on the Prague Castle Square. What is more, I have found exactly the same one in the Albert and Victoria Museum as well! 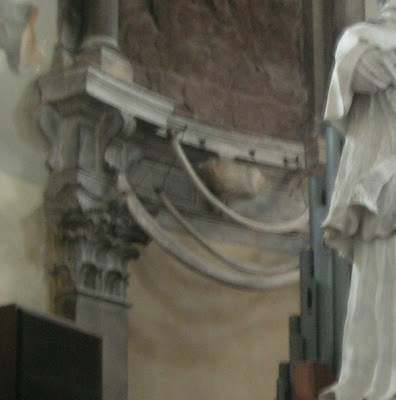 I never knew about the "relic" in the basilica of Santa Maria e Donato. It think it's rather fine actually to possess the bones of a mythical beast. I agree with Father that it's far more fascinating in its way than the more famous mosaic floor. I've searched high and low on this subject, but come up with no very definite answer. The Greek "dracon" (sorry for the transliteration, I can't type Greek letters on this keyboard,) suggests a giant serpent of some sort. Biblical narratives mention sea monsters. Oriental mythology also envisages a giant serpent (not always of ill omen), but the consensus in different cultures is that the dragon was serpentine or reptilian. The fossilised bones preserved in Santa Maria e Donato are probably mammalian and therefore most likely those of a dinosaur or archosaur. Ucello's dragon is highly stylised, but conforms fairly closely to the popular image of the dragon, a winged, scaly beast with massive jaws. But now that I know of their existence, I find I rather like this church's relics : "Here is the shrine of St. Donatus, and here are the bones of the monster he slew." Oh that we would all have that inscription above our bones and the bones of the dragons we slay. I think Pope Benedict would have a pile of idea bones rather than dragon bones. It's a great dish, isn't it - but it stains your lips black, I always find. This was what I most wanted to see in Murano but sadly my friends had other ideas. St Elizabeth of Constantinople slew a dragon that was inhabiting the ground she wanted for her convent by stamping on its head. It would make a wonderful ikon.